Before Toine Daelmans first started restoring church bells and tower clock installations, he gained a lot of experience at a bell foundry which worked for customers all around the world. Being self-employed, Toine Daelmans has been restoring, delivering and maintaining all kinds of church bells, carillons and tower clock installations since 1986. In the Netherlands , he has brought about 600 large and smaller installations back in their original state. Abroad, for example in the United States , Egypt , Suriname , Scotland as well as in lots of mission countries, he has carried out similar activities. 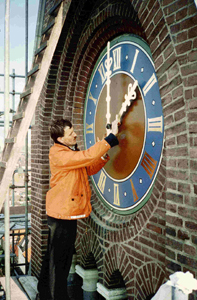 Nowadays, Toine Daelmans uses his experience and expertise by providing professional advice as well as maintenance and restoration solutions for all kinds of church bells, carillons and tower clock installations.